For encaustic work, it is important that you only use natural-bristle brushes. The bristles of synthetic brushes may melt when subjected to heat. Chip Brushes – Chip brushes from the hardware store are affordable and come in a variety of widths, ranging from 1” to 4”. These are the brushes I started with and continue to use. Because they are inexpensive, I have a brush dedicated to each color family I use for minimal cleaning. If you are on a budget, these are definitely the brushes to buy. I also find their short handles convenient since they don’t stick out too much when they are resting on the griddle. Hake Brushes – Hake is an Asian-style brush with a long flat handle and usually made of goat or sheep hair. It has smoother bristles compared to chip brushes and apply paint more evenly on a surface. It comes in several different widths and the wider brushes work well in covering large areas with medium or paint. Although usually more expensive, the one I use is comparatively inexpensive. You can purchase the same ones here. In the video below, I demonstrated how the chip and hake brushes apply encaustic paint so you can see the difference. Round Brush – It is a good idea to have at least one to use for detailed work. The one I use is a 6mm round brush. It is common for bristles to fall out of brushes and get embedded in your painting. When this happens, simply pick the bristles out with a dental tool or the edge of a blade and gently fuse over the affected area to smooth it out. One of the many things I love about encaustic is you don’t have to clean your brushes too often. Just warm a used brush on your encaustic palette and it’s ready to use. When you’re done, let it cool down and it’s ready to be stored away. When you do have to clean a brush, it’s very easy to do. You can use either paraffin or soy wax to clean your brushes and palette. Paraffin is made from petroleum while soy wax is made from soybeans. Since soy wax is more sustainable and eco-friendly, it is the better choice of the two. 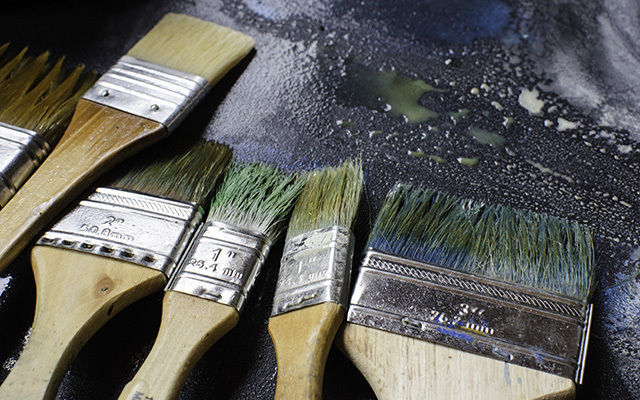 To clean your brush, just wipe off any excess paint from the brush on a paper towel. Rinse the brush in soy wax and wipe off the wax with a paper towel. Repeat rinsing until no more paint transfers. You’ll find a demonstration in the video below.